For several years I’ve vaguely noticed this flower in a couple of road-side ditches in Gravenhurst and mentally labelled it as butterbur. The other day, seeing it flowering, I took a step into a ditch alongside Campton Road to take a closer look and a picture. Later, when looking at this image on-screen and thinking to find something out about the plant, I realised that although similar to butterbur, Petasites hybridus, this isn’t butterbur. Butterbur flowers in March, so after discounting this as an example of the effects of climate change, right here at home, a quick glance in a field guide suggested that this was winter heliotrope, Petasites fragrans, a plant introduced to the British Isles from southern Europe, apparently in 1806. One web site I found, doesn’t like it much because it’s a tricky thing to get rid of once you’ve got it. So I suppose we should be digging it up before it breaks loose to compete, on our river banks, with Himalayan balsam and Japanese knotweed. For me though, flowering in December is a clever enough trick to earn it a place in the garden. 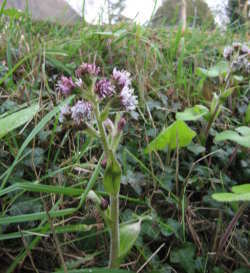 Botanists amongst you may be tutting or raising eyebrows at my previous error, for winter heliotrope not only flowers three months before butterbur, but also produces leaves at the same time as its flowers, whilst butterbur never does anything so obvious. Doh! According to the guide I consulted, the flower is vanilla-scented. Sounds good; of course I’ll have to try it. So if you drive past whilst I’m in the ditch, sniffing things, you’ll know why.